On July 12, 2018, Dr. Mark Scholl’s new textbook, Postmodern Perspectives on Contemporary Counseling Issues, was published with Oxford University Press. Dr. Mark Scholl published his latest text, Postmodern Perspectives on Contemporary Counseling, in July 2018. This text was co-authored by Dr. Scholl, Associate Professor of Counseling at Wake Forest University, and Dr. James Hansen, Professor of Counseling at Oakland University. 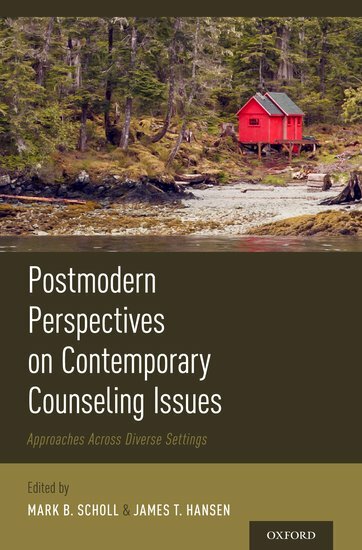 Expert scholars and practitioners contribute chapters that explore the implications of postmodern theory for counseling practice. Solution-focused, narrative, and other postmodern approaches are explored in relation to clinical issues such as trauma, social justice, addiction, education, and more. 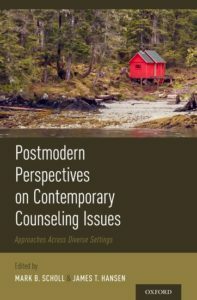 One of the text’s greatest strengths is its vignettes and case scenarios, which offer students and practitioners the opportunity to identify and utilize appropriate postmodern counseling interventions and techniques. Dr. Gerald Juhnke, Professor and Associate Dean at the University of Texas at San Antonio, calls it an “impressive resource” and a “practical and innovative” text. Congratulations on your publication day, Dr. Scholl! Dr. Mark Scholl is an Associate Professor of Counseling at Wake Forest University. He received his Ph.D. in Counseling and Counselor Education from UNC-Greensboro in 1998. He is a past two-term editor of The Journal of Humanistic Counseling and Past President of the Association for Humanistic Counseling. Dr. Scholl also received the National Career Development Association‘s 2018 Diversity Initiative Award.